On a wind swept day in March, while I was shopping in a busy Northwest Fresno plaza, I spotted a curvaceous baby grand piano through the open door of the American Cancer Society Discovery Shop. Its sunbathed, feminine profile and polished wood exterior drew me to it with the force of a magnet. Decades before, I had experienced the same haunting attraction to still another piano, as my father and I walked along Fordham Road in the Bronx, along a bustling, cobblestone street dotted with stores like Alexander’s that attracted a steady stream of buyers. The first love of my life would be found on this very block, in Mazilli’s warehouse, an odd fixture, among the more popular establishments in the area. Its dark and dreary space housed a sea of eye-catching pianos of all shapes and sizes. Myron Buchbaum, our corpulent and faithful piano tuner insisted that his friend, Mazilli had a never-ending supply of instruments that were plucked from lavish estates in the north Bronx and then rebuilt to impeccably high standard. To this point, he’d been tuning my Wieser, an old upright piano of questionable value that cost my parents $50 and a lot of anguish. Hardly a note played without buzzing and beating, and some in between the noisy ones, would not sound at all. The piano, however, served me in good stead during my years of study with Miss Schwed, who’d beaten the soul out of me with her ponderous, hand pounding accompaniments on the lid of a music school piano. Music that managed to squeak through this monstrosity was savored by my endearing parakeet “Tykie,” who, when released from his cage for his daily exercise landed on the keyboard and hopped from note to note, leaving little droppings in his wake. All at once prompted by the music I was practicing, he’d soar to the ceiling, sometimes bumping his tiny head against it. “La Chasse” and “Tarentelle” from Burgmuller’s collection of “Twenty-five Progressive Pieces” inspired his fancy free flights, after which he’d settle back down on the keyboard for a restful pause. As we grew older together over years and my repertoire steadily advanced, he experienced the joy of our newly acquired 1922 Sohmer upright purchased from Lucy Brown, concert pianist. Though the sonorous instrument had become the instant love of my life erasing memories of a toxic tonal hell associated the Wieser piano, the Sohmer would be prematurely retired due to the effects of bitter New York City winters and humidity packed summers. And at the time of a raging blizzard, Tykie would die from pneumonia. In a matter of years, I was off to the Oberlin Conservatory at the urging of my newest piano teacher, Lillian Freundlich, who nurtured my love for the piano even further. A grad of Oberlin herself, she could see no other option for me. With a Performance Degree in my hand after four arduous years of study, I was now ready to own my very first grand piano! The lovely sheen of a medium size, ebony grand situated in the front of Mazilli’s warehouse drew my ardent gaze. It had the elegant Steinway name and lyre emblem imprinted on its fall board. It was springtime when the grand piano begged me to sample its sound universe. In the space of a moment I was seated in front of it, drawing deep musical phrases from its core, and without reservation, on the spot, I knew that this was the piano of my dreams. Mazilli, a hunched over man in his fifties, approached the shimmering instrument with a conspicuous limp. He looked like Gepetto in his work apron, holding an odd-looking sharp, metal tool along with an estranged hammer from among 88 installed in a piano. It was obvious to me that he’d taken pause from his grueling labor to nurse along a sale. By the glaze in my eyes, he knew instantly that I didn’t need his sales pitch. In no time, my father, a railroad man of modest earnings seized the moment and made a piano purchase that would resonate for years to come. Without even a hint of hesitation, he handed $2,800 in cash to the Italian immigrant who had become instant family through this life-changing transaction. After having been temporarily immersed in memories of the Bronx, I urged myself back to the present–to Fresno where I was currently drawn to the Discovery Thrift store of the American Cancer Society that had a donated piano peering through its entrance way. A neighbor to commercial establishments such as Save Mart, Subway, the Beerocks shop, the thrift store’s bread and butter donations were items of clothing, furnishings, house ware, paintings, and jewelry, but occasionally, a piano would roll onto its floor. An exotic looking pianoforte in rosewood stood before me with stunning, engraved carvings on its façade that verified it immediately as an antique. Its filigreed rack with retractable candle holders was awe-inspiring. I’d never seen anything like this other than period piece pianos pictured in the glossy finished volume, Clinkscale’s Makers of the Piano. And by its appearance alone, this instrument should have been housed at the Smithsonian or in a comparable museum of rare instruments, not among pot holders and towels placed on a shelf next to it. I noticed the curvature of the wood on one side, with another abruptly squared off, suggesting the scale of a mid-Nineteenth century piano, but not being a music historian or archivist of early instruments I could only draw on my conservatory background with an abundance of music history courses. 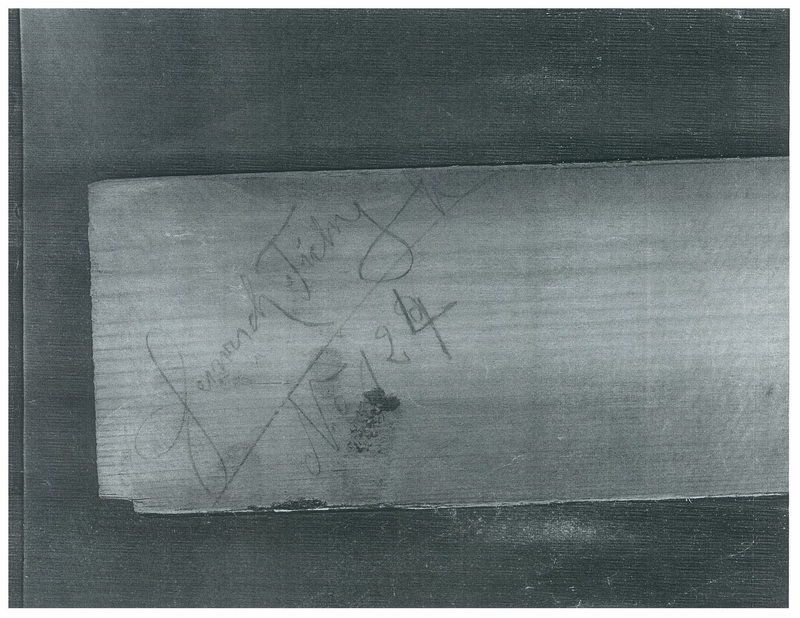 The lovely, feminine appearing piano had “J Fritz Sohn” engraved into a wooden plate affixed to the fall board that evoked the esteemed name of “Johann Fritz” who had built Fortepianos, that were predecessors of the modern piano. Yet I wasn’t certain that “J. Fritz” was related to him. Since sohn translated to “son” in German, it was conceivable that the instrument was made by the son of Fritz, but who would know for sure? I had a formidable appetite to learn more. Looking at this diminutive and splendorous antique I was reluctant to play it for fear that drawing a sound from it would snap its age old strings and possibly cause it to collapse, but I knew I would take the risk and throw fate to the wind. The fall board was shaky and out of alignment, requiring a technician to mend it, and while this piano’s magnificent exterior was exceedingly impressive, it might not translate into a remarkable sound image. I dared myself to take a seat in front of it and once there, I plunged into its keyboard discovering immediately its capacity to sing out and register its character and personality. To my surprise, the aristocratic but fragile looking instrument produced a hugely resonant sound that belied its 5 foot dimension. Though it was painfully below concert pitch, but relatively tuned across its keyboard at 100 “cents” down, (one whole step), its striking bass still jumped out of itself, ringing off the plaster walls! As I drew deep phrases from it, I noticed a conspicuous black pedal bar bobbing up and down each time I depressed the sustain pedal and I couldn’t imagine why a piano builder would install a such a noisy and discombobulating piece of hardware that provided drum beating, accompaniment sounds! These hearkened back to the days when Fortepiano builders installed numerous pedals in these instruments and added built in rhythm sections of tambourines and cymbals. It was quite a spectacle! I scoured the Fritz inside and out, searching for clues to its background and identity, but all I could ascertain was its recent ownership history. “Mary Papazian,” a local resident had acquired the piano for $5,000 from Chesterfields, a Fresno antique establishment and she then donated it out to the Discovery Store. Supposedly, it was originally obtained through a San Francisco auction house. On my way out of the thrift store, I bumped into an elderly man who wore a proper gentleman’s cap and carried a heavy rectangular, black tool box. From his appearance, he had all the markings of a piano tuner, but I didn’t recognize him as someone who had ever entered my piano sanctuary in a search and destroy mission. Most of these fellows in our neck of the woods had learned the trade simply through a correspondence course or by tearing down a piano and then re-assembling it. Many a fine instrument had been gutted in the process. The stocky fellow, lugging a big metal box headed straight for the antique piano, causing me to retrace my footsteps and linger awhile to establish communication with someone who might own a fountain of knowledge about the Fritz. This would be one of several treasured anecdotes he would retread over and over in the course of our budding friendship that was ignited in the Discovery Store on a breezy, spring afternoon. Eventually, he would tell me that his grandpa also ran a dairy farm where little York was expected to milk cows. I wondered if he could enlist his well developed, over-sized hands to make a piano adjustment. “Mr. York, could you please fix the shaky piano keyboard cover?” I asked. “I sure kin fix anythin’ so long as it’s needin’ fixin,’ ” he said. He demonstrated his repair skills by banging out the fall board and removing the end support blocks. Then he re-installed it with a proper hinge attachment. He detached the music rack and took a careful look at the hammers like he was an inquiring country doctor. I came closer to see what I had already observed for myself but this time I felt honored to be under the tutelage of what I thought to be a master technician. “But you know what,” I said, “the instrument plays like a dream and captures the Romantic era sound. You just can’t dismiss that.” It had an uncanny resemblance to Frederic Chopin’s Pleyel piano that I’d encountered on the Internet. “Nah, it can’t be a musical instrument, period, ‘cause it can’t be tuned,” York said. He’d already broken out his tuning fork and discovered the piano was a whole step below concert pitch verifying my impression of it. He was tweaking a string and adjusting its contact with a hammer. The he wrote up an invoice noting what he’d done to the piano, adding the word to “donation” to the slip that was placed on top of the piano. “That’s very generous of you,” I said, as he was packing up his toolbox. “Hey is it possible we could find a serial number somewhere inside the case, or maybe a builder’s name so we could get a clue to the date it was crafted?” I asked. “Well, let me take another look,” he said. York disassembled the piano once again and showed me a penciled signature that was hard to decipher by its classically styled inscription. The stocky tuner ducked out of my way as I situated myself at various angles to capture the complete signature and the full piano image. When I was done, York closed the piano and packed up his tools. I imagined his granddaddy giving him a flogging for being tardy. On his way out he handed me one of his self made, blotchy business cards, then he headed toward a brown pick up that was visibly packed with piano related hardware. I had a premonition that we’d meet again soon, I just knew it. It was more than 6 months later that the Johann Fritz sold. The Assistant Chief of Police at Fresno City College purchased the piano after it was priced down from $5,000 to $2,000. But before it arrived safely in its new home, a local physician had entered the Discovery store and offered quick cash for its immediate possession. Store volunteers who were not made aware of the “hold” on the piano, sold it to the second party, until the manager returned from vacation and restored the instrument to its rightful owner. I had earnestly wanted to own this priceless Fritz but hadn’t a stitch of extra space to house it at the time. Squeezed into tight quarters with my Steinway M, 1917 eating up most of my living area, I reluctantly let it slip away from me. I sat at my computer at home sprinkling a few more e-mails with an attached photo of the Fritz, to reputable restorers of old instruments around the country just because I wanted to know more about the Fritz piano and its place in history. The many responses to my inquiries were heart-warming and informative. “The ‘conspicuous’ black bar that bobs up and down as you describe it, is an indication that the piano you were so happily performing on was one with a “Viennese mechanic,” an old, now antiquated mechanism to operate the striking and damping system. There are thousands of these pianos left mainly in Europe, from an equal number of unknown makers. They can indeed be wonderful to play. As a matter of fact, most European piano music up until 1880 or even 1890 was composed on such pianos, until the mechanism pretty much as we know it today, became standardized. One of piano history’s many enigmas is why these pianos didn’t get more attention if they played such an important role in the history of classical music repertoire. Indeed, museums have tended to ignore them, not to mention the open market. Pianos as this one can be bought in Europe for a few hundred dollars, even in decent playing condition, because no one is interested in them. “Your description of the piano was excellent. Everything you described is consistent with a grand piano dating to the 1870’s. As for the size, I don’t have a lot to say. Even in the 19th century, grands were built in a variety of sizes. Terms such as baby grand and parlor grand are vague and have no parameters. I’ve always suspected they were invented by salesmen to help sell pianos. “The penciled inscription is probably the signature of one of the craftsmen who built the piano. I doubt if it will help you date the instrument. row, in order to let the strings and frame adjust to the new tension. overtones, so it sounds whiny and dirty. be someone who can be trusted to work on the Fritz piano. Streicher! It is extremely resonant and clear, perfectly articulating the contrapuntal bass lines in Schumann's music, which I feel loses more in the transition to modern piano than the music of any other composer, except maybe Brahms. “As you suggested in your last correspondence, many vintage pianos that hardly need overhaul are forever ruined by those who are on automatic pilot to refurbish, restore, recondition, or whatever else motivates some of them to destroy original sounding pianos. “So, Patricia, I think you and I are in agreement about some overzealous re-builders who have found a new and profitable industry for themselves and will often ruin pianos that might not need anything but tweaking. “Please know that you and your husband are my heroes in your passionate pursuit of historical instruments such as the Fritz, among others, that you carefully restore and bring to life through historical performances at the Frederick Collection. 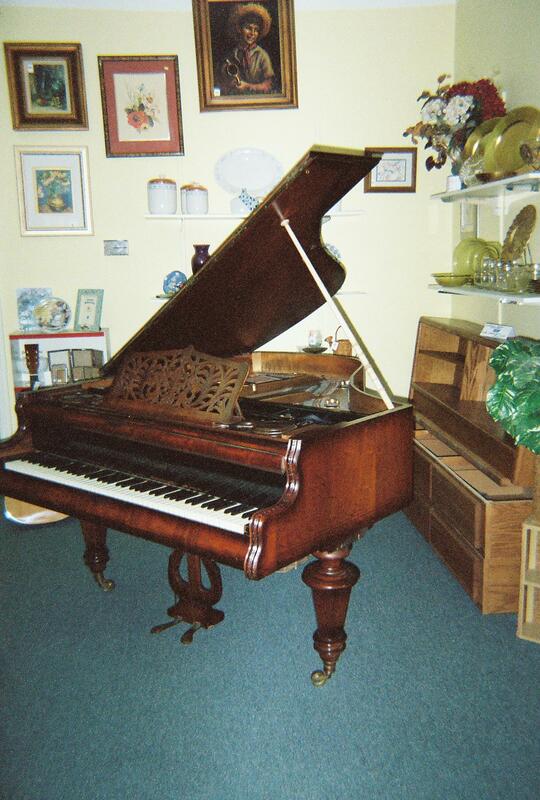 I thought back nearly nine months, when I had first encountered the Fritz piano, and how far I had come, through all this time, learning about period pianos and restoration practices. It was an eye opener, to say the least, and an adventure I would always treasure. Hindsight is 20/20 but I wish I had bought the Fritz and placed it safely in my piano room in northwest Fresno. It would have been a welcome addition to my two Steinways. But as the next best compromise to ownership, I still had the sweet memory of its tone, and every day I admired its colorful photograph amidst my student portraits. Next postPatricia Frederick’s text is provided in full where it had some missing parts in the Fritz Blog.